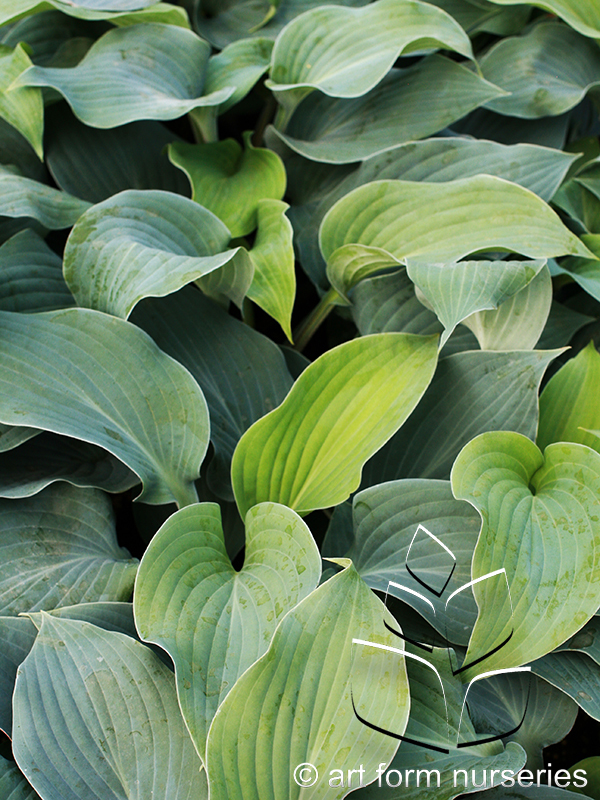 Attractive variegated hosta has dark green leaves with golden-yellow edges. August bloomer. This medium size hosta is a showy sport of 'First Frost'. Leaves emerge frosty blue with bright yellow margins, which lighten to creamy white during summer. Holds up late in the season. Light lavender flowers mid to late summer. Golden yellow centers with 3" wide dark green margins. Pale lavender flowers. Another large blue hosta, the heart shaped leave on this plant are huge. Attractive, white flowers on 48" stems. A sport of 'Halycon' with wide creamy white margins and a blue center in spring. The margins get whiter in summer. Lavender flowers. A long lasting blue hosta that deepens to a blue-green late in the season. Lavender flowers held up on mauve scapes. 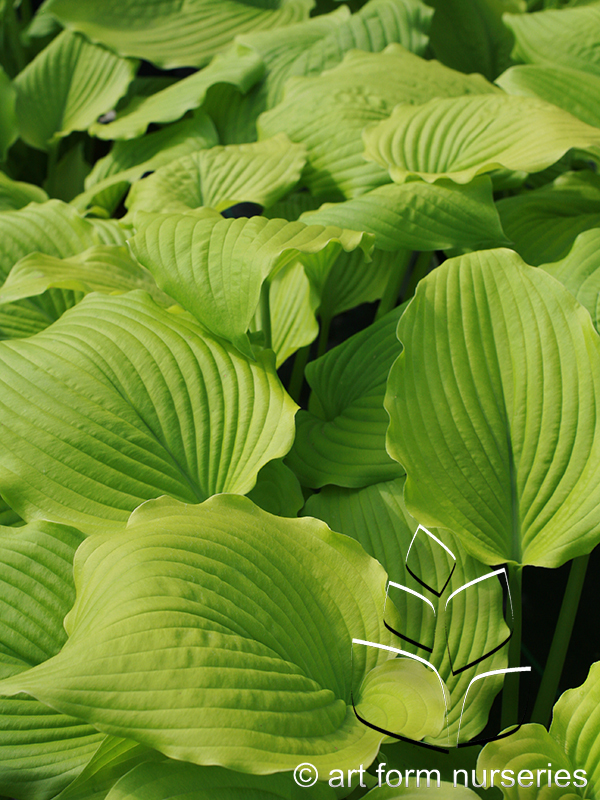 This hosta makes a statement with its large solid gold, thick, puckered foliage. In the spring the leaves are a chartreuse yellow and lighten to gold in the summer. Pale violet flowers. 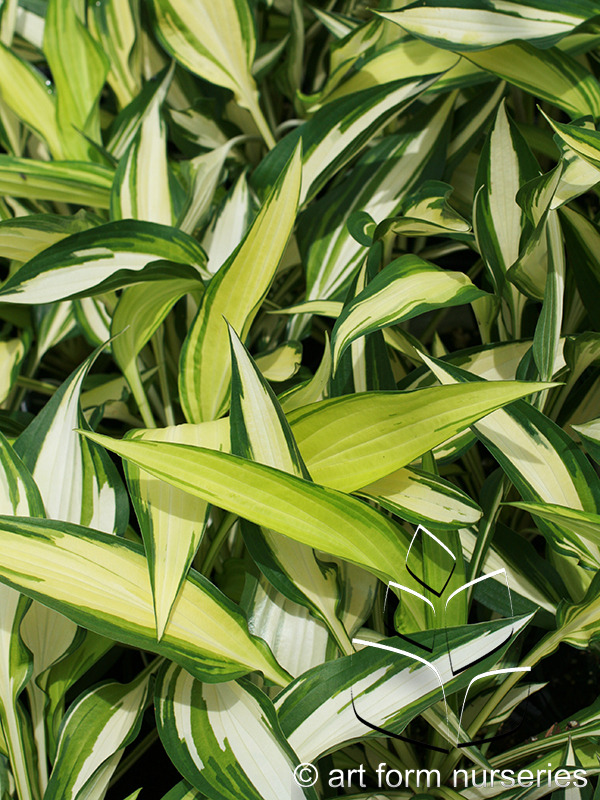 Long, tapered leaves have bright green margins with white centers. A vigorous grower with lavender flowers. The pie-crust edged leaves emerge bright yellow and remain yellow all season. Lavender flowers. This huge hosta has pointed green leaves, with bloom stalks that get 7' tall. Light lavender to near white flowers. Huge, thick, dark green, deeply veined leaves form an awesome upright clump. This is the largest known hosta in commerce. Makes an unbelievable statement in the garden. Pale, reddish-violet flowers. 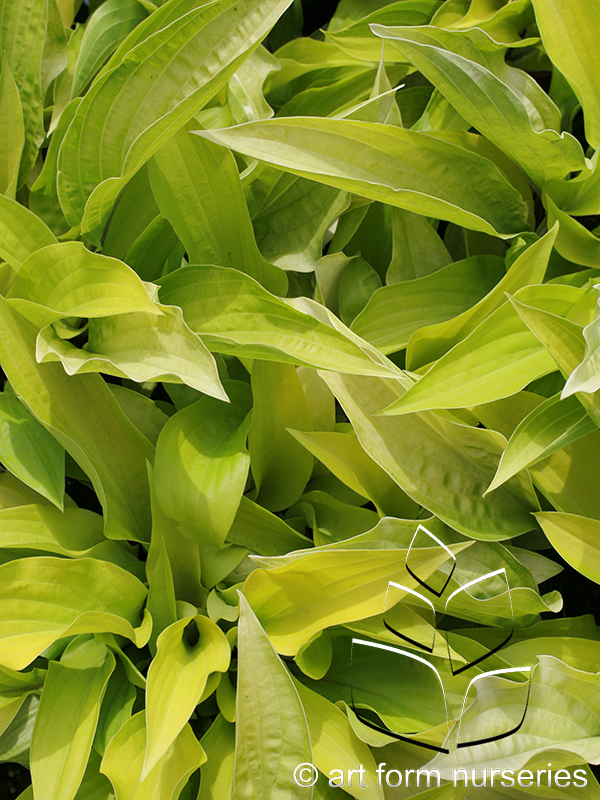 A vigorous growing hosta with bright yellow leaves that emerge on red petioles in spring. The red extends into the base of the leaves. Foliage darkens in the summer. Lavender flowers. A sport of 'Halycon' with blue leaves and gold margins in spring that change to pure white late in the season. Holds up nicely in the fall until first frost. Lavender flowers in mid-summer. Hosta of the year 2010. 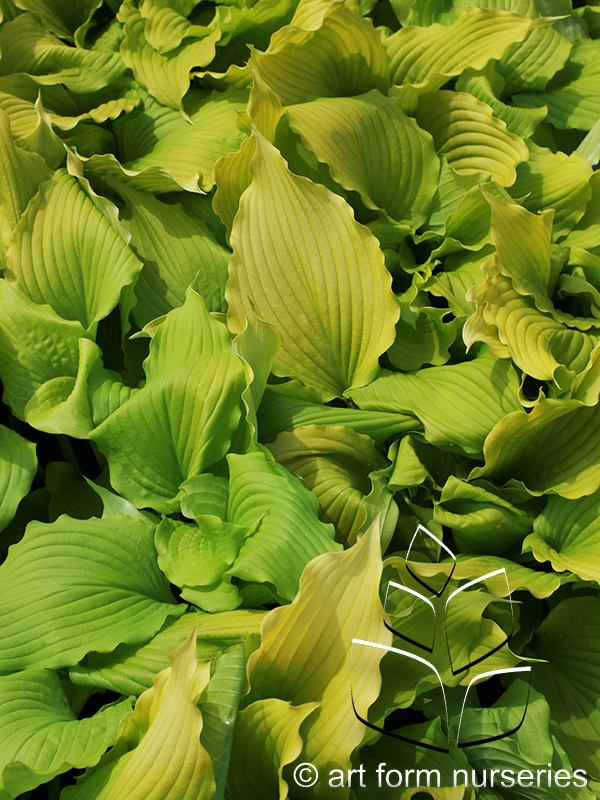 Slow growing, this heavily corrugated hosta leaves have gold margins and a blue-green center. Resembles 'Frances Williams', only smaller and does not get leaf scorch. Pretty heart shaped green leaves with narrow white margins on this rapid growing hosta. Forms a very attractive neat looking mound. A small, fast growing hostas. Green leaves with wide gold margins that change to cream in summer. Dark lavender flowers in summer. Chartreuse leaves with wide green margins. Fragrant, white flowers in late summer. The American Hosta Growers Association Hosta of the Year for 2002. A late blooming hosta with gorgeous, heart shaped, steel blue leaves. Low growth habit makes it a perfect edging or border plant. A very handsome blue for the shade garden. Blue-green, corrugated, puckered leaves have a wide, feathery white center with green jetting between the center and margin. Lavender flowers.